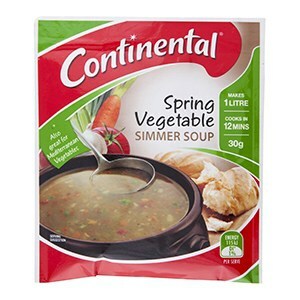 Making (delicious use) of everyday supermarket dehydrated food instead of those awful backpacking meals: Continental Spring Vegetable Simmer Soup + 500 ml water (1/2 quantity) + I Tablespoon (approx) Surprise Garden Peas + 8 Teaspoons Continental Deb Instant Mashed Potato. Try it. Yoou could try adding some of this to it if you want some more protein: http://www.theultralighthiker.com/hormel-real-bacon-pieces/: After you have done so, start thinking about other dehydrated (eg Continental) products such as their Gravies and Sauces and their meal bases. Cheaper and much tastier. Hi Steve, I gave it a go tonight. I added almost double the potato you suggested to make it more like a stew than a soup. It was quite tasty and filling. I would suggest it was too much for one but may be not enough for two? How many do you think it would feed? Probably ok for two if you combine it with something else? Do you have any desert ideas for hiking?